Towards the end of 2003, soon after the formation of the Game Programming Club (I had just started second year), we decided that we should make a game, as a team. We swiftly divided out general and poorly scoped tasks to everyone, not really considering that not everyone had the same goals. My part was the engine, and I started working on it immediately. The plan was to create a Diablo-like action RPG. The communication was quite scarce, and after a while, I found that I was taking the game, titled Project One, in my own direction. Soon, everyone was doing their own thing, and I gladly continued by myself on Project One for about a year, on and off. I've included the source code for anyone interested. The plan had never been to make something as broad as this, which can explain the poor quality of the application. If I could start it again, I'd definitely write it in a more modular fashion. But it still makes me happy. It gave me something nice to do between school assignments, etc. It is a Visual C++ 6.0 project, with a very small amount of outside code (TGA loading mostly). I'm also including two videos captured way back in 2004. 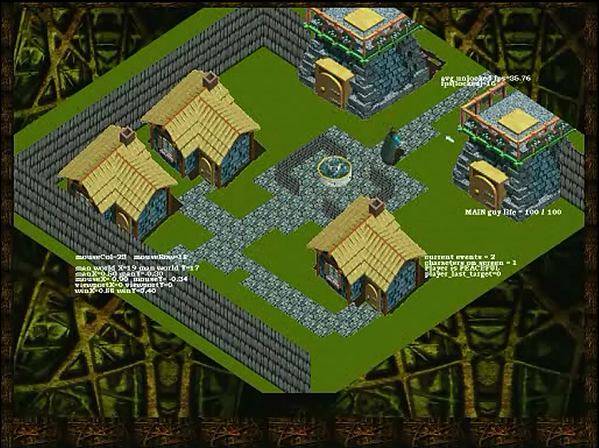 The first shows some of the game's capabilities, and the second shows the map editor in action. the map editor, I have no idea.